Former Australian captain Allan Border said the secret of little master Sachin Tendulkar’s phenomenal success is his technique to adapt to all kinds of wickets and different anywhere in the world.He can play shots all-round the wicket like most great batsmen. But he is particularly among the best at playing straight. His trademark straight drive with the high elbow and full face of the bat is a purist’s delight, and a few play that shot better than Sachin, Border said. And he went on adding "My earlier insight into Sachin’s talent was on India’s 1992 tour to Australia. The Indians struggled in the series, but Sachin stood out, and it was clear that new talent has arrived.During that I was amazed at his adjustments in style ,technique and his stunning proficiency off playing the back foot shots on bouncy pitches. "Sachin made a brilliant 148 on a Sydney wicket,But it was his 114 at Perth that convinced me that he would be a force to reckon with in future. In 90s WACA was far quicker and bouncy, putting batsmen’s technique to tight scrutiny. He enjoyed playing strokes off the front foot, but his adjustments and supreme control off the back foot at Perth were a treat to watch," he added. 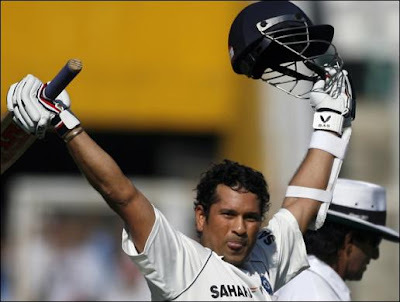 "Sachin has dominated a number of world-class performers in his outstanding Test career. He has outsmarted Shane Warne on numerous occasions, and has performed exceptionally against fast bowlers of the caliber of Curtly Ambrose, Courtney Walsh and Waqar Younis." Border Added.